For guidance about how to set up a development environment that fits your needs, see Two types of SharePoint Add-ins: SharePoint-hosted and provider-hosted. The following table lists useful articles that can help you understand the concepts that are involved in a list view customization scenario. SharePoint Add-ins Learn about the new add-in model in Microsoft SharePoint that enables you to create add-ins, which are small, easy-to-use solutions for end users. UX design for SharePoint Add-ins Learn about the UX options that you have when you are building SharePoint Add-ins. Host webs, add-in webs, and SharePoint components in SharePoint Learn about the difference between host webs and add-in webs. Find out which SharePoint components can be included in a SharePoint Add-in, which components are deployed to the host web, which components are deployed to the add-in web, and how the add-in web is deployed in an isolated domain. The following steps show you how to customize a list view that is deployed to the add-in web by using client-side rendering. Create the SharePoint Add-in project. Create a new list definition with a custom view. The following figure shows a client-side rendered view of an announcements list. 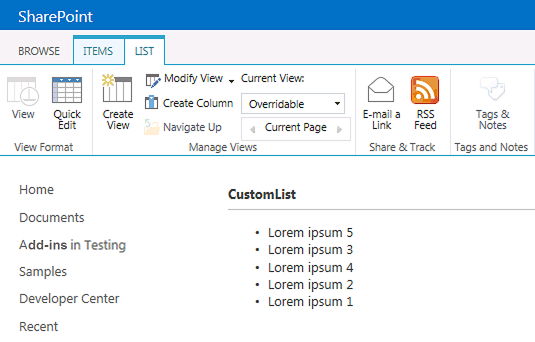 Create a new project using the SharePoint Add-in template. 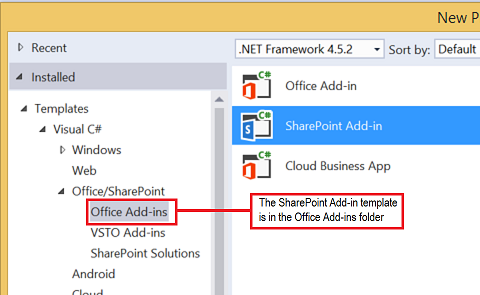 The following figure shows the location of the SharePoint Add-in template in Visual Studio 2015, under Templates > Visual C# > Office/SharePoint > Office Add-ins. Provide the URL of the SharePoint website that you want to use for debugging. Select SharePoint-hosted as the hosting option for your add-in. Right-click the SharePoint Add-in project, and add a new List item. Create a customizable list based on Announcements. Declares a new view named Overridable with a BaseViewID=2. The JSLink property is not supported on Survey or Events lists. A SharePoint calendar is an Events list. Provides event handlers for the PreRender and PostRender events. Provides templates for the Header, Footer, and Item template sets. // Initialize the variable that stores the objects. // header, footer and item. // This template is assigned to the CustomItem function. // Register the template overrides. // This function builds the output for the item template. // It uses the context object to access announcement data. // Build a listitem entry for every announcement in the list. // Override the default title with user input. // Reverse order the list. When you select F5, Visual Studio builds the solution, deploys the add-in, and opens the permissions page for the add-in. Select the Trust It button. Go to your custom List by entering the /Lists/<your_list_instance> address relative to your add-in directory in the add-in web domain (not the host web domain). Add one or two announcements. On the ribbon, select the Overridable view.